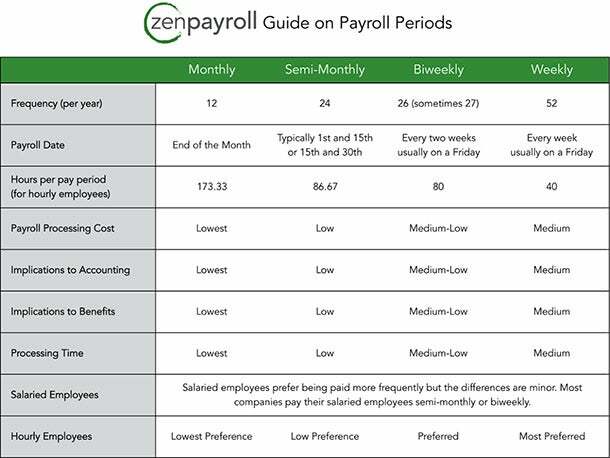 Every business has to decide which payroll schedule is best for their outfit and employees. The most common frequencies in the U.S. are monthly, semi-monthly (twice a month), biweekly (every two weeks) and weekly. State laws typically require a minimum pay period -- you can always pay more frequently but not less. Each pay schedule has advantages and disadvantages, so let’s take a look at the differences between semi-monthly and biweekly, the two most popular options. Semi-monthly vs. biweekly payroll. The differences may seem minor. After all, they sound the same and there are only two extra checks for biweekly (26) versus semi-monthly (24). While most employees prefer being paid more frequently, there are pros and cons to either pay period for both employer and employee. Your accountant runs monthly reports, not weekly reports. That is why your accounting department may prefer semi-monthly pay periods, since the last paycheck of the month will typically coincide with the end of the month. For companies paying their employees biweekly, two months out of the year will have three pay periods instead of two. Your accountant must have payroll expense accruals so costs are recognized in the month the compensation was paid. Benefits also typically run on a monthly basis. Some of your employees may have voluntary deductions for healthcare. With semi-monthly, these deductions are easy. If you are paying your employees biweekly, however, you will have to manage deductions based on the total number of annual pay periods (26 pay periods or 27 in some years). So who prefers biweekly pay periods? Salaried employees are exempt from collecting overtime but hourly employees are not. That’s one reason hourly employees prefer biweekly pay periods. Hourly employees may have inconsistent weekly work schedules, which can include overtime. For example, your employee may work 60 hours one week. For a biweekly pay schedule, this overtime is easy to calculate. It is more complicated for companies on a semi-monthly plan because they typically pay their hourly employees at 86.67 hours per period (which is a little over two 40-hour weeks). If those extra hours are between two different semi-monthly pay periods, you will have to make adjustments and it can be confusing. The advantages to weekly payroll. Weekly payroll is not a popular option for most companies outside the trades (e.g, construction, plumbing, etc.) industry. One of the most prohibitive reasons is cost. Most payroll vendors charge each time payroll is run. If you have dozens of employees on weekly schedules, those fees can add up. Another stumbling block is that each time you run payroll, it can take up a lot of time for you or your payroll administrator, especially if there are payroll accruals and overtime. Weekly payroll may be an attractive option for your employees though. Just like hourly employees prefer bi-weekly pay periods, they may prefer weekly periods even more. Weekly payroll better matches an hourly employee’s cash flow needs. If an hourly employee has an irregular working schedule with overtime, weekly payroll best reflects the compensation she’s earned. For example, if your employee works 60 hours one week and 20 hours the next, weekly payroll makes sure your employee is paid that valuable overtime in the first week when she may need it most. Even salaried employees may appreciate getting paid more often!